To me, Civilization 2 has for many years been the Bigfoot of the Civilization series. You can find the original Civilization on abandonware sites quite easily, and once you’ve got it you can run it via DOSBox with zero fuss. You can buy Civilizations 3 and 4 on Steam, and they both still work fine apart from the missing Gamespy functionality and the occasional crash to desktop. But Civilization 2? It’s not available on GOG, but acquiring a copy of Civilization 2 via alternative methods is just as easy as Civilization (so long as you’re happy with losing the music, the wonder videos and the advisors, anyway); however, it was a Windows-native game released in 1996 — in other words, that awkward period where Microsoft were still sorting themselves out in terms of drivers and APIs for Windows-native games. Consequently it doesn’t play nicely at all with modern versions of Windows, and since it doesn’t have a commercial release on a digital distribution platform it’s entirely reliant on dedicated fans to drag it into a state of semi-compatibility. Getting it to work on Windows 7 was a bit tricky, but doable. Getting it to work on Windows 10 was nigh-impossible until a new fan patch was released towards the end of 2017 that specifically addressed Windows 10 compatibility; up until I found out about it I was seriously considering installing Windows XP on a virtual machine just so that I could play Civilization 2 again. 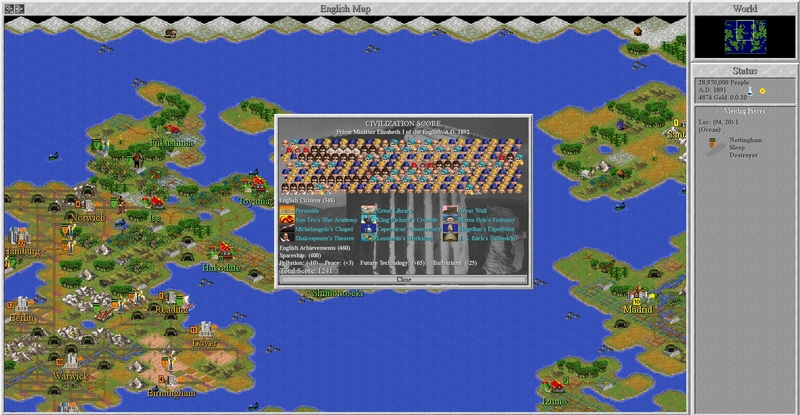 Fortunately, unlike all of the other fan patches I tried the new one works quite well, and so I get to enjoy classic Civilization 2 upscaled to a resolution that would have made my eyeballs drop out of their sockets had I experienced it in 1996. It scales nicely, too, since it went for some quite chunky unit sprites and terrain tiles that retain all of their character (as well as their readability) when displayed at 1920×1080 instead of 800×600. Because it runs as a windowed app and uses, well, Windows windows for its interface panels (another reason why backwards compatibility for it is a pain) there’s some weirdness around trying to access things while e.g. 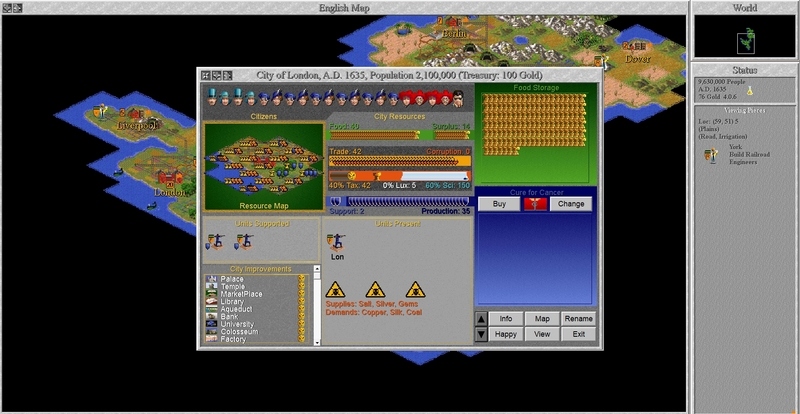 the City Interface panel is open — Windows 10 flat out won’t let you — but otherwise it’s aged remarkably well, far better than the original Civilization and it also arguably looks better than either Civilization 3 or Alpha Centauri. Design-wise Civilization 2 is rather interesting, because of all the Civilization sequels it’s the only one that was a direct evolution from its predecessor. There’s no major new mechanics introduced in Civilization 2; it’s still very recognisably the same game with an SVGA facelift and the rough edges sanded off. It makes changes, sure, but the changes it makes are more the sort of thing I’d expect an expansion pack to do in this day and age: bulking out the tech tree, adding more units and improvements for a smoother flow through the medieval and industrial ages, and tweaking wonder effects. This is the main reason why playing the original Civilization is a little redundant unless you’re feeling particularly nostalgic for it, since Civilization 2 is quite literally everything that Civilization was — and more. Civilization 2 does set out to tackle some of the most egregious mechanical flaws that cropped up in Civilization, mind. First, the Pyramids -> Democracy loophole has been closed off, as Pyramids now gives you a free Granary in every city (still really good) and the ability to switch to any government has been moved to the much later Statue of Liberty wonder. The government system and corruption all work the same way, so brute-forcing Democracy onto your empire is still a very good strategy, but it’s nowhere near as easy to pull off as it was in Civilization. Then there’s the combat system, which has been made far less random. It still works on attack/defence value totals (e.g. if a unit with attack value 6 attacks a unit with defence value 3, it has a two in three chance to win a round of combat as the total of both values is 9 and 6 is two-thirds of 9) but is now fought over several rounds. To accommodate this all units now have an HP bar that gets depleted when they lose a round of combat rather than the unit being instantly destroyed. Not only does spreading the combat rolls out over several rounds mean that the effect of the odd statistical anomaly is greatly lessened, but unit HP increases with the technology era of the unit, increasing the number of successful rolls that an obsolete unit will require to win. I’m sure there’s still a mathematical possibility for spearmen to beat tanks in Civilization 2, but I’ve never seen it happen and I doubt you will either. For example, I don’t think any of them feature terraforming beyond chopping down/planting forests, likely in an attempt to combat Infinite City Sprawl. There’s no such thing as a bad city site in Civilization 2, because any bad city site can at some point be turned into a good city site. Even if you settle on a one-tile island it can eventually be made worthwhile with the Harbor and Offshore Platform improvements, which add food and production to sea tiles. 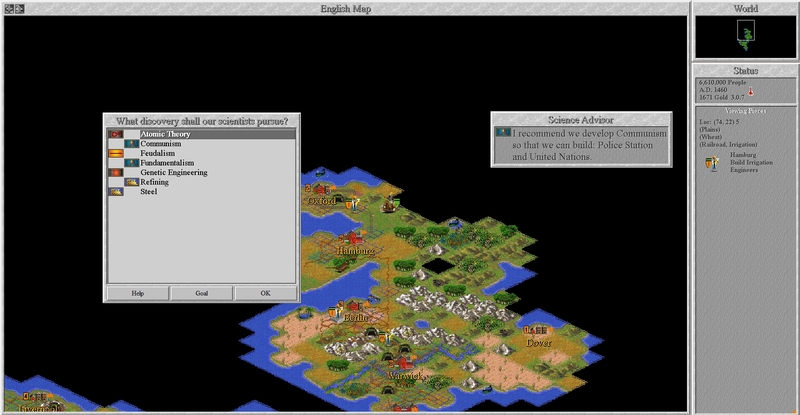 Consequently ICS is an absolutely obnoxious problem in Civilization 2, especially given that the AI is just as flagrant with its territorial violations as in the original and is also very capable of using ships to transport Settlers in the ancient age; the AI in more recent Civs would wait until much later to do that, if it did it at all. You feel like you have to settle on any scrap of land that’s unused, even if you’re not going to get that much out of it right now, because if you don’t the AI eventually will. When you uncover the map by discovering Satellites (another new innovation, as Civilization only gave you city locations) it’s shocking to see just how densely packed it is with cities. And more cities means more to micromanage, as production queues aren’t introduced until Civilization 3. As a consequence it can be a bit wearing to play Civilization 2 into the late game. Because I hadn’t played it in so long I’d built it up in my head to be rather more than it was, and it was a little disappointing to discover that it didn’t quite live up to the memories of my after-school play sessions. I said earlier that it had aged well, and it has, but Civilization 2 instead comes across as being rather dated. 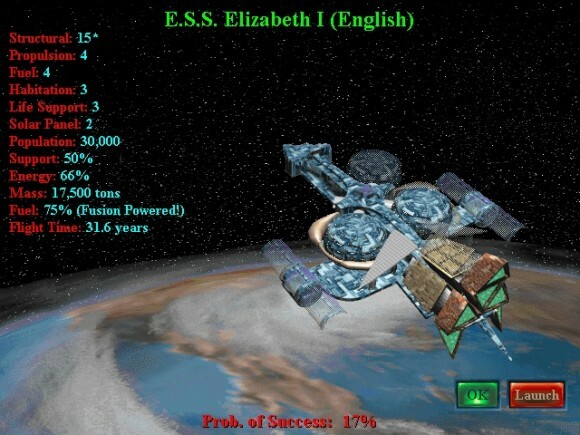 Being dated is a rather more ambiguous quality than being aged — Back To The Future and The Terminator are very conspicuously dated, but that doesn’t stop them from being classics — and quite aside from some of the more tired gameplay aspects Civilization 2 definitely feels like a game released into the Windows 95 era. There’s that use of native Windows functionality and fonts, for a start, followed by the totally unnecessary yet not wholly-unwelcome full motion video that you could find jammed into just about every game from this period, because computer games were still much smaller than the total amount of storage available on a CD and developers had to do something with all of that space. Civilization 2 was the first game in the series to feature wonder videos, which put together archive video and/or panning shots over historical images of the thing you just built with a very cheesy midi track. Today they look a bit high school history project-y, but you can see how we got from there to the excellent Secret Project videos in Alpha Centauri, and even though they’re cheap by modern standards they still have an atmosphere of respect for — and wonder at — the thing you’ve just built. Every time your council meets you get these incredibly cheesy videos of LARPers in tacky period-appropriate costumes spouting advice about what to do next, which other people are quite fond of but which I am not and always turn off at the first opportunity. And then, finally, you’ve got the music. The base game shipped with some basic midi tracks, but the Test Of Time expansion added a bunch of custom scenarios with dedicated music which is probably still the best soundtrack in a series replete with excellent soundtracks; it’s a set of weirdly off-kilter themes that are supposed to represent fantasy and sci-fi worlds which are somehow incredibly appropriate for charting the march of your civilization from the ancient age to the modern one. Many of these features that were all the rage at the time come off as rather gimmicky today, of course, but they do serve to give Civilization 2 the most character of the first three Civilization titles. Because it’s mostly choosing to refine an already-successful formula instead of breaking new ground it’s also the most well-rounded of the three, and is the one which is easiest to slip back into today. 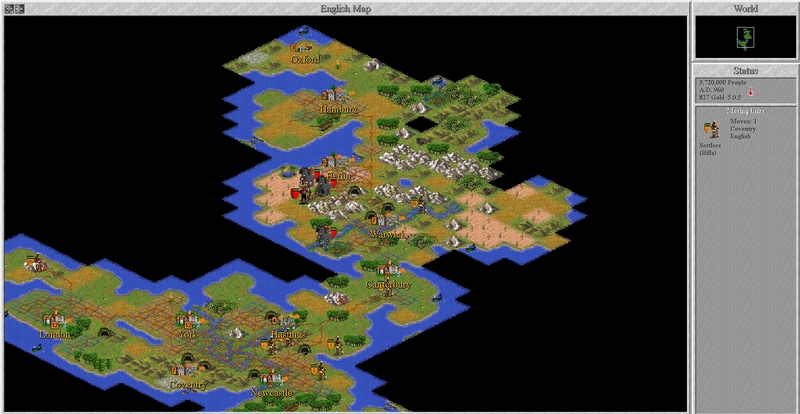 It feels like Civilization as it was originally envisaged, before subsequent designers began moving it further and further away from its starting point, and aside from missing quality-of-life features (like production queues) that elegance of design presents remarkably few friction points for players revisiting it twenty-three years later. Civilization 4 eventually dragged the series into the modern age, and Civilization 5 was patched to the point where it could more-or-less sit next to 4 without instantly withering away like a Nazi drinking from the wrong Grail, and I think both of them are better games — but they also both feel like bigger commitments than Civilization 2, whose comparatively simple mechanics make it easy to pick up and complete multiple games in a single afternoon. That, along with its very different character, ensures that even now, after almost a quarter of a century, Civilization 2 can still hold its own against the latest and greatest the 4X genre has to offer. The only one I’ve never played. Heard a lot about it though. Many still regard this as the best one. Maybe we’d have better games if iterative design wouldn’t be a slur. The problem with purely iterative design is that you’re iterating towards a goal, and once you’re there there’s nowhere else for a series to go — or worse, you iterate off at a tangent and eventually create something that’s almost impenetrable to anyone who hasn’t played the entire series. A period of iteration should follow a title with revolutionary ideas, but you need both to make a series that lasts more than a decade without stagnating. This is my second favorite in the series, and probably the one I have the most fond memories of. I played a ton of this in the couple of years after release, and it always felt so satisfying to finally have my empire crosshatched with rail lines. But it really did become a slog in the late game, all of them to to some extent, but this one was particularly bad from my recollection. Agreed to both. It’s a classic, and still fun to play, and much friendlier than Civ 1, but that’s only because I prefer science victories over building out wide and conquering the world. Even with the 12-ish cities I built on my replays and a purely defensive military it was just on the cusp of being annoying. One of the things I loved about Civ 2 was the different scenarios made for it. I have the ‘Classic Collection’ big box (and thanks for the link to the patch so I can play it again), and that included a couple of scenario disks – Fantastic Worlds and Conflicts in Civilization. Essentially, these were like Civ 2 total conversions with new graphics, tech trees and objectives (for some of them). These ranged from real conflicts – the civil war, the Mongol horde, etc; to fantasy – Jules Verne, Atlantis, etc; to official conversions based on Master of Magic, Master of Orion and X-Com! Anyway, as someone who loved those scenarios but is too lazy to type these words into Google, I was wondering if there are similar things available for later Civs? I keep intending to go back to Civ 2 and play through all of those scenarios. One day. I’m not a fan of Civ6 in general but I have to say it has great scenarios. I liked them more than base game cause of their brevity and fresh design. E.g. there’s Vikings scenario. You chose one of Vikings factions and have a miniature game of Civ on a premade map. It has city founding and upgrading, some limited diplomacy, religion, culture, tech, war, exploration. You get points in a variety of ways and you win by having the most points. And each Viking faction has some uniqueness to them. There I didn’t care if AI understands victory conditions and all that jazz, it felt like a complex board game. And it didn’t have padding or baggage that came with the theme.